Kathryn Corbiere tried to find a job as a welder after getting her certificate, but it just didn't happen. In the long runs it's a pretty great thing. She now runs her own business out of a building she built and designed, selling her wares. 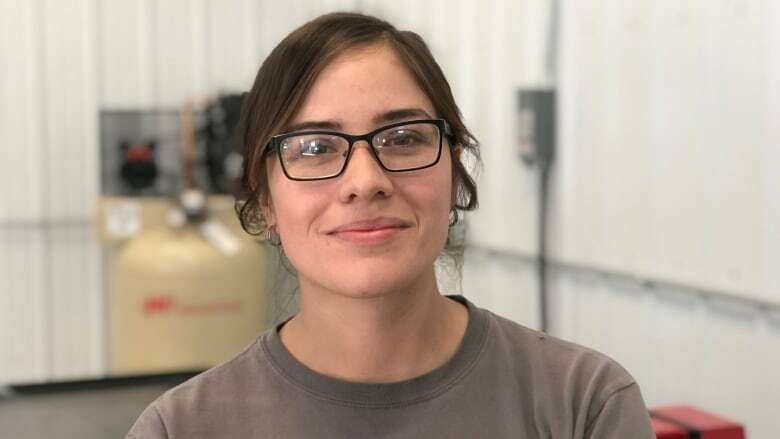 Kathryn Corbiere tried to find a job as a welder after getting her certificate, but it just didn't happen. In the long run it's a pretty great thing. She now runs her own business out of a building she built and designed, selling her wares. Corbiere makes everything from signs, to furniture to custom fabrication. "Anything to do with metal really," says Corbiere. 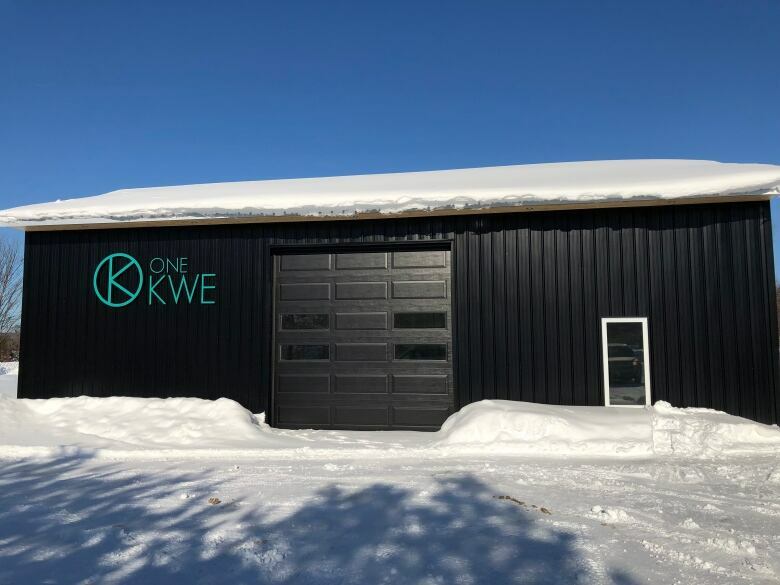 Her business is called One KWE which means one woman in Ojibwe and is located on M'Chigeeng First Nation. It all started with her making modern furniture for her home. She posted some of her work online and caught people's attention. 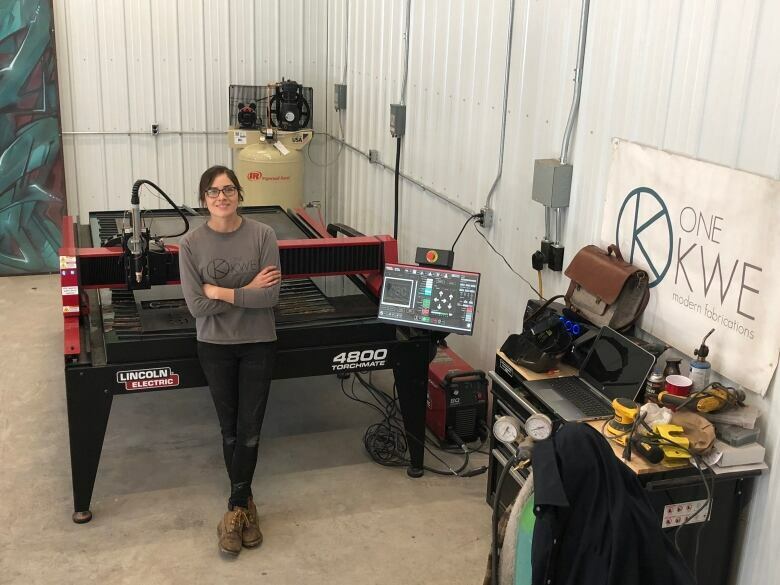 She then befriended a local welder who taught her how to use her plasma cutting table. It is controlled by a computer and compressed air and electricity says Corbiere, and can cut up to 3/4 of an inch of steel. "I never thought I'd have this table here in my shop, but here it is, this Lincoln Electric 4 x 8 table" says Corbiere. This way she can make anything from custom parts to business signs, to pieces for furniture and art. Corbiere used all her skills a few years ago to help create an art piece with Pride Manitoulin's youth group for the island's first pride week. It is now featured at the Ojibwe Cultural Foundation. "It was really nice for the youth to have a sense of pride in help designing that piece." She describes it as a modern take on something traditional. The five foot tall free standing structure is made with chains and steel. 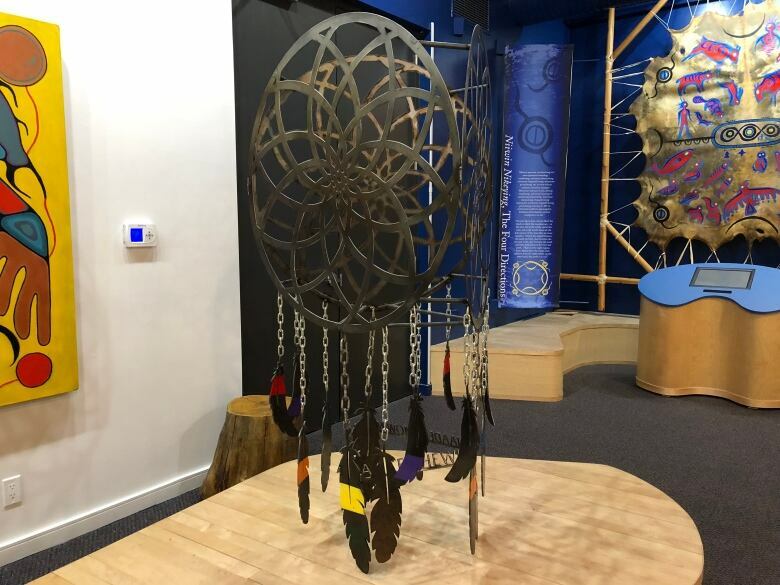 It is a three sided dream catcher with three Ojibwe words that say respect, love and courage. "I was quite honoured to do that." As for her business, she says it just keeps growing. She built her own shop to reflect her style. "It is a black modern space, with cedar soffit, and a sign I did and you are automatically intrigued by the modern design you don't really see around here," says Corbiere. It is extra special to have a business like this in your own community, says Corbiere. She also has plans to expand her shop in the future.